Awaken Your Clients With an Energizing Aroma! When the winter months roll around, your clients are going to be coming in more worn out and tired than usual. With shorter days and less sunlight, they are going to be in need of some energizing! You can instantly liven up your clients by simply just adding something like the Lotus Touch Energizing Soy Candles to your spa. It will fill your spa and treatment rooms with a clean and uplifting aroma consisting of peppermint, thyme, spearmint, and lime. These candles are 100% soy wax and contain no man-made fragrances or petroleum. They are fragranced with pure essential oils and do not release any harmful petro-chemicals. These are also great as a retail item for gifting! (That time of year is just around the corner!). Aside from the Energizing candle, they also come in Balancing and Calming. Energizing: An invigorating combination of peppermint, thyme, spearmint and lime. Calming: A soothing blend of sandalwood, rose, neroli and jasmine. 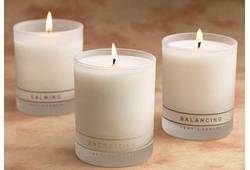 Balancing: A harmonious fusion of lavender, patchouli, ylang ylang and orange.